Vladimir Yengibaryan, a Yerevan-born boxer who won a gold medal at the 1956 Melbourne Olympics, died today at a hospital in the United States. Yengibaryan was a welterweight boxer who won gold at the 1953 European Anmateur Championships in Warsaw, and then again in 1957 (Prague) and in 1959 (Luzern). He was awarded the Honored Master of USSR Sports title in 1957. After retiring from boxing, Yengibaryan founded a children’s boxing school in Yerevan, the first of its kind in the USSR. Yengibaryan had been living in Los Angeles since the early 1990s. 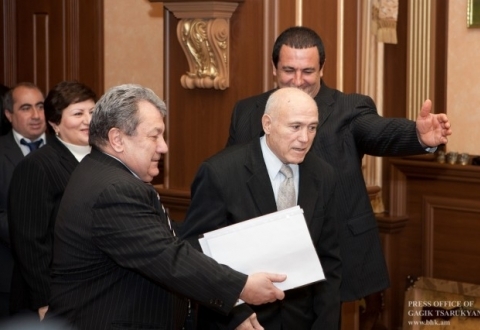 Olympic champion, famous Soviet Armenian boxer Vladimir Yengibaryan passed away on Friday in Los Angeles. The athlete died at the age of 81. Champion of Melbourne Olympics, three-time European champion Yengibaryan was born in Yerevan on April 24, 1932. In 1959 he founded republican boxing school. He moved to the U.S. in 1995. The funeral will take place in the U.S.
Edited by Zartonk, 04 February 2013 - 11:55 AM.